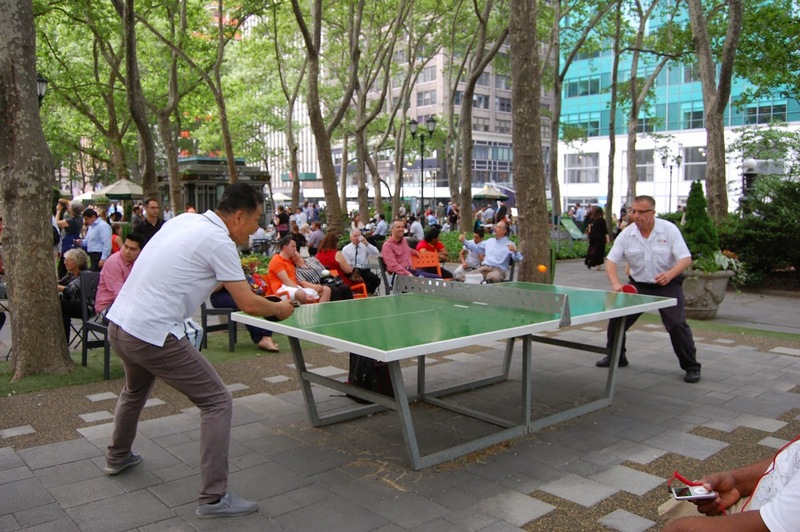 Bryant Park Blog: Ask Bryant Park: What are the Daily Amenities? Ask Bryant Park: What are the Daily Amenities? In the Ask Bryant Park series, we hope to shed light on questions the public frequently pose to us about the park. If you have a question you'd like us to cover in this series, please comment below or email us at bpc@urbanmgt.com. We are frequently asked about the many activities available in the park, like ping pong, the putting green, and Petanque (among others). These are what we call "Amenities," meaning they are permanent parts of the park that are open daily and do not require any pre-registration or reservation. We want you to be able to enjoy these activities as much as you would like, which is why we have dedicated so much of the park to a variety of amenities. These activities are all available in addition to our regularly scheduled and special events, which you can find on the online calendar. Just like laundry or a pool is an amenity for an apartment building, the putting green and Art Cart are amenities for the park! To find out more about our amenities, see below for a short list or check out our "Things To Do" page instead for a complete calendar of our amenities and descriptions for each. We also hold periodic events at some of our amenities, like Tournaments and Championships, so be sure to check out our calendar for information about those. Located in the park along 42nd Street near 6th Avenue, the Tables are the perfect place to meet friends for a match (or make friends during a match!). It is completely free to play, all equipment is provided, and all you have to do is put your name down with the Games Attendant to reserve the next open slot. If you're feeling more competitive, we also offer monthly Ping Pong Tournaments. A crowd of spectators watch a game get going on the Tables. Whether you have a specific game in mind or just feel like sitting down and rolling the dice, the Games Area has a collection of over 30 games that are free to use. We also offer Games Socials which provide the opportunity to meet new opponents in a fun and open setting. Know how to play chess and looking for a partner? Or maybe you have always wanted to learn? Our resident Chess expert is on hand to either match you with an opponent or show you the ropes. Unsurprisingly, there aren't many golf courses in Midtown. But fear not! Bryant Park's putting green is the perfect place to brush up on your putting skills. Whether you're a pro or just want to hit the ball around, the Green is your own little slice of a golf course right in the middle of the city. Get your creative juices flowing at the Bryant Park Art Cart. Use your lunch break to make a masterpiece or bring the kids to make some arts and crafts with professional-quality materials provided by Materials for the Arts. The Art Cart's variety of materials provide endless options for crafty fun. Petanque, a French game of boules, is located on the 6th Avenue side of the park. Learn to play with an instructor from La Boule New Yorkaise, participate in one of our monthly tournaments, or book a private party! Our very own Bryant Park Carousel offers a great time for the kids (or adults - we don't judge!). Made to complement the park's French classical style, the carousel is adorned with characters, including Flaubert Frog, our semi-official park mascot! Whether you bring your own book or borrow one from our large collection, the Reading Room is the perfect place to sit back and enjoy a good read. The area is stocked with tons of our favorite bistro chairs and a Reading Room Attendant is always on hand. Even outside all of our events going on in the park, there is still a ton to do. We want the park to be active and fun at all hours so all of these amenities are open daily for most of the day. Stop by to try one out during lunch or spend an entire afternoon trying out all of our activities!